Most winters we get some snow here and there, and the total we get adds up to a pretty decent amount. We also usually get rain, however, or at least a solid thaw. We don’t typically get lots of snow that stays on the ground as the kind of snow one can enjoy. It often turns to slush, or freezes solid enough to walk on. This year we have snow for skiing and it has been sticking around. This past week was vacation week from school. All of us were home and we did not venture anywhere beyond our local haunts. This meant we went skiing several times. We leased skis for our kids this year, as we have the past couple of years. This is a good deal, first because they our kids are growing so fast that buying skis makes little sense financially; they will grow enough that the boots and skis are too small by the next season. As a bonus with the lease deal each set comes with an envelope of coupons. These include free or discount passes to local ski areas. Those coupons alone make it worth the lease. The amount we save with them more than pays for the lease. This past week we skied at Bolton Valley. It was cold. It has been a cold winter and last week that cold continued. Some of the days last week we ruled out as ski days just because it would have been unpleasant. When the high temperature is forecast to be in the single digits in the valley, with strong winds, well, skiing just isn’t all that fun. It takes a lot of energy to ignore numb toes and frozen cheeks. It gets unsafe even. But we went when temperatures were in the teens, and the sun was shining. That was way fun. 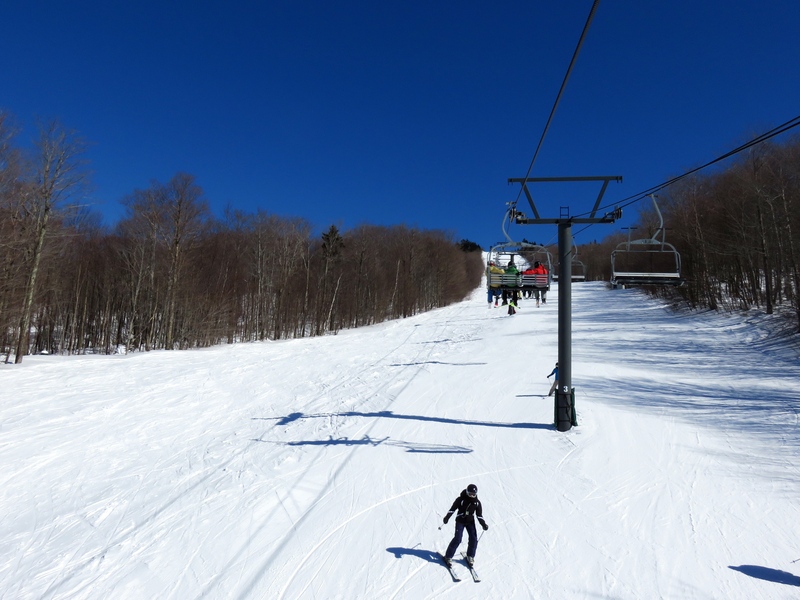 The last time we went was what one calls a Bluebird Day–clear skis and no wind and just awesome. We rode the lift up and skied our way down over and over, breaking only for lunch and heading home in the afternoon. Tons of fun. When your kids are tuckered and they tell you “I love skiing” on the way home, you know you have hit the winning number. Since we live in a state with many ski areas, it makes sense to take advantage of that resource. The snow was great (not icy at all as it often can be when the snow fails to accumulate enough), the sun was shining, and we all have the skill to really just have a blast. Plenty of people will tell you they are sick of winter, but when we get so much snow, and it keeps piling up, I just cannot complain. I hate to complain anyway. That just seems like a waste of energy to me. Enjoy this now while it is here, I say. Spring will be here soon enough. When I was in high school I read an essay called Return to the Lake. I remember that it was a good read, although I couldn’t tell you who wrote it, and I remember that I, along with some other folks, visited Lake Winnepesaukee soon after reading it. The essay was essentially about visiting, as an adult, a lake that had had meaning when the writer was younger. I returned to my own lake this past week. We all went, this nuclear family of mine. We swam and swam and ate and swam some more. My children love the place, that place being Three Mile Island Camp. It is an Appalachian Mountain Club camp where I worked twenty years ago. I loved it then. It had a huge impact on my life. It still is pretty good. We stayed in a couple of tiny adjacent rustic cabins right on the lake. I got up every morning, looked out at the still water for ten minutes or so, laid my glasses on the dock, and slipped into the water. I felt cool and calm. Some mornings I swam with loons. One morning I swam in the rain. Then I climbed back to the small porch and waited for my wife and my children to waken. We had little to do all day. Meals are prepared by the staff and they do the clean-up. The cabins have no electricity, although the main house where family style meals are served does. We played and swam and rested and spent time with friends. We ate at the appropriate times. When it rained we hung out on the porch and drank tea and chatted while the children played games inside. Life is pretty good like that. We ate salad and corn on the cob (local but not ours) and blueberries (we even had some of those ripe!) and veggy burgers for dinner. We looked out over the field and decided it is as good as looking out over a lake. It was hot. If we were still on the lake we would have just jumped in the drink to cool off. The air has cooled now. The children are off to bed early. I am happy to be home. I could have stayed longer but, like Christmas, experiencing it only once every year increases its appeal and its value. If we lived there year round we couldn’t have this amazing garden. We will return next year to swim and to play and to rest. We have some of that to do around here in the remaining days of summer. And a little work to do as well. Once we get enough work done, we can return to the lake once again. And we will love being there all over again.